A staircase in the house can come in handy in different situations. For example, many people have several high cabinets in their homes where they can not get to the top edge without a step. This is only one of the different situations in which it is recommended to use a ladder to prevent unsafe conditions. In this case you can of course choose to use a standard ladder, but it is usually a lot more interesting to opt for a designer staircase. Such a ladder is equally comfortable and safe to use, but looks a lot better. Would you also like to order a designer ladder for your home? Then you are already at the right address! Let us start by saying that a designer staircase here at Nordic New is always available in different versions. For example, we distinguish various colors. Do not think exclusively of the standard wood color, but also think of black, red and even white. For which of these colors in the area of ​​a designer staircase you will eventually choose depends on the style of your interior as well as the colors used in it. 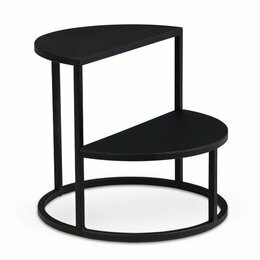 Be sure to check out the Step Ladders from Design House Stockholm. In a sleek and modern interior, for example, the colors white and black can be perfectly expressed, while in a more classic interior the normal wood color is highly recommended. Anyway, in whatever color you want to order a designer ladder, it is perfectly possible here at Nordic New! You can not use a design ladder as a matter of course only to get something of the top shelf out of the cupboard, what about also to do various chores? For example, replacing a lamp is so much easier by using a design ladder. Once you have taken such a staircase in your home, you will undoubtedly be surprised how often you will use it. Are you not in the mood to jump into your home using a standard ladder and prefer to opt for the special look that a designer ladder has? Then we can undoubtedly be of service to you from Nordic New. By taking a look at our assortment you will undoubtedly discover one or perhaps even more design steps that would come into their own in your home. Do you want to purchase one of these stairs in the end? Then you are assured of the best possible price, while no shipping costs for deliveries in the Netherlands and Belgium are charged.